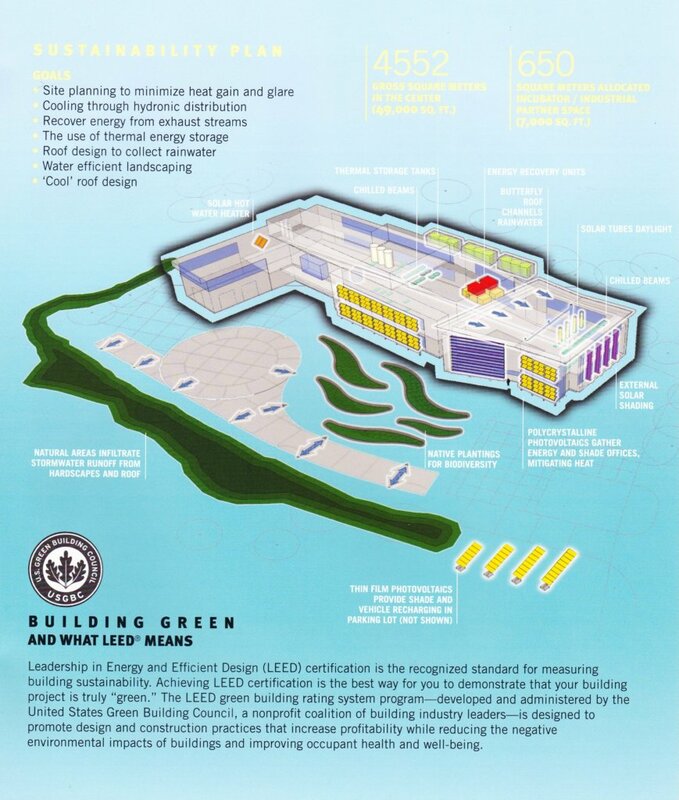 The Energy Research Center building is the flagship facility for the newly created Advanced Energy Research and Technology Center (AERTC) and is the second building to be built at the Stony Brook University Research and Development Campus. The center will forge partnerships between universities, industry and national laboratories to develop reliable, economical and plentiful sources of energy. Leveraging existing capabilities and partnerships, the energy center actively promotes clean and economical energy strategies through research, technical applications and community outreach. The facility will concentrates these efforts on five scientific focus areas: (1) Renewable Energy, (2) Hydrogen Energy, (3) Fuel Cells, (4) Conventional Fuels, and (5) Energy Conservation. The organizing idea for the facility is to provide a variety of open flexible laboratories that can be customized to meet specific technical requirements and made available to industry and research communities to perform highly specialized research focused on advanced energy issues. Core Laboratory Facilities will be provided to support these research efforts. As a response to the sustainable design guidelines set for the project, the site design initiatives are to limit the extents of project disturbance, minimize grading and hardscape, and provide sustainable techniques of storm water management. Site amenities within the project include: naturalized landforms on the south side of the site development, a small outdoor entry plaza near the front door, rain gardens for storm water infiltration and public education, and a small employee patio on the north side of the facility. To minimize maintenance required for lawn care, lawn plantings of a short stature, low maintenance native wildflower meadows are proposed. The design solution for the AERTC is a direct response to its scientific mission and functional requirements. As part of a Greenfield sustainable minded research and development park, the AERTC architectural layout is comprised of three formal responses. These include the head or “front door” of the structure is comprised of the office block and majority of the “public” support spaces. As the center of human activity within the building, fostering first impressions to many guests, it is comprised of an open atrium like spaces surrounded by offices of lead research scientist, their assistants, and the AERTC director. Maximizing visual transparency of these spaces, as well as views to the outdoors, will promote a welcoming impression to outsiders and guests, while promoting and affording opportunities for interaction and collaboration among users in many of the building support areas. Finally this area has a roof form which demonstrates rain water collection being used within the facility, as well as solar attenuation to the south and east, two of many illustrated and engineered sustainable design attributes incorporated into the architecture of the AERTC. The furthest west form, is programmatically comprised of a scale-up highbay heavy engineering laboratory, this two story element bookends the immediate site while creating a clean facade to the western side of the campus, relating to the planned nature trails. On the south face of the building is a system of solar shading devices. This fixed system is equipped to accept or be substituted with photovoltaic cells. Other support lab spaces in this area include a “greenhouse” for photovoltaic or solar apparatus experimentation, and radio-frequency lab and other shared lab support functions. Where appropriate, this creates opportunities to demonstrate some of the science taking place within; this is one of many sustainable features and scientific demonstration capabilities of facility which will be incorporated into the design of the building, rendering a unique building which “walks the talk” of its mission.The body or “spine” of the facility is the laboratory wing. A centrally located double loaded corridor sharing core labs, shared equipment labs, and flexible space labs. Formally, this portion of the building has the greatest correlation to the East/West axis which affords the best opportunity to control undesirable environmental influences on the building such as solar gain, and visual discomfort. This laboratory spine is also balanced with an unobstructed northern exposure which admits more favorable environmental conditions by reducing energy consumption needed to mechanically condition the spaces while offering the best visual comfort. The interior spaces focus on a connection to the exterior views and natural light access for all users of the facility. This connection will begin at the main employee and guest entry and its adjacency to an open two story commons area that pulls the lab and office components together into an interactive core. Materials and finishes being considered for this facility will focus on a simple and timeless approach. The selections will enhance the simple building design and provide a durable and maintainable set of surfaces.The massing of the facility is an expression of the strong sustainable environmental considerations as well as a reflection of the interior functions of the building. The lower two levels where occupied space resides are clearly differentiated from the penthouse and screened rooftop equipment areas. The taller penthouse volumes serve to visually tie together the three programmatic masses. The mechanical penthouse will also step back from the perimeter edges of masses below to allow for a better human scale. Most facility service and support functions like docks, exhaust fans, and at grade mechanical equipment are veiled by screen walls or tucked into receding building masses. Roof top fan units will be concealed with screened walls. Throughout the construction process we were engaged to review all LEED submittals, prepare the construction team and educate them on all LEED specific requirements, answer questions, and ensure compliance. In the end the project achieved fifteen (15) construction credits as part of the projects overall Platinum Certification.